These optical measuring devices were developed for contactless measurement of thicknesses and profiles. The measuring process uses the principles of optical coherence tomography (OCT), in which light with a low coherence length is used together with an interferometer to measure distances. The measured objects are scanned at several points. A moveable sensor head can scan the surface profile and/or thickness profile. The depth resolution is only limited by the coherence length of the light source. It is also dependent on the refraction index of the sample. The device acts as a server (can work on a stand-alone basis and has an integrated computer), which can be contacted using one or more software clients via a simple TCP/IP connection. This makes it possible to display the results simultaneously or analyze them at various points. 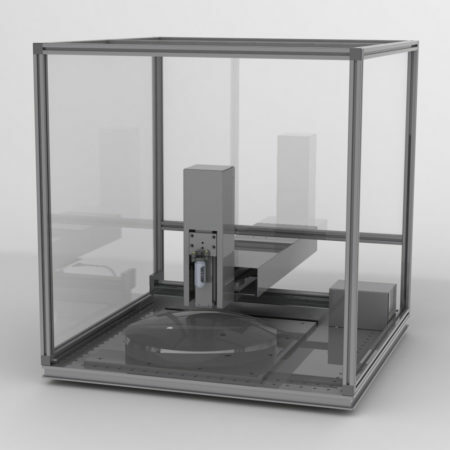 We can also develop custom OLCI systems for any kind of measuring setup, according to customer wishes. Depending on the needs and application, we can produce axis systems or devices for stationary measurement. We would also be happy to integrate the measuring device into a production process. Light sources with varying wavelengths are used depending on the application. OLCI stands apart compared to other procedures. Although very high precision and resolutions (Z resolutions in the range of 0.1 nm) are possible with white-light interferometry or confocal microscopy, these systems cannot “go in deep” and therefore cannot measure thicknesses or films. They also have problems with large aspect ratios (side ratio, width to height). A HP OLCI device developed by OPTEG is more precise than standard OCT processes.